Bringing you the ambience of a wood fire, without the mess of burning wood, a quality gas log set or contemporary burner in an existing woodburning fireplace will surprise you and your guests with its’ warm realistic flame. Glass and Rock burners bring a new decorator look to your home, complimenting a wide range of designer style. These decorative log sets and contemporary burners come with a variety of sizes and styles to choose from and conveniences such as remote control and electronic ignition. You are sure to find just the right set to fit your fireplace at Pacific Energy Company. Hargrove has the best looking logs on the market. 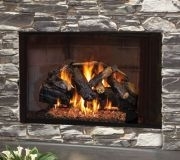 Gas logs have traditionally been made from concrete and silica made into a slurry and poured in a mold. The mold is the key to authentic looking logs and Hargrove uses real logs to fashion their molds. With many styles and sizes to choose from, we are sure that Hargrove has the perfect gas log set for your fireplace. A gas log set can use up to 80,000 BTU’s of gas an hour – we recommend that they are used strictly as decorator product for infrequent use at family get togethers and holidays. If you want to switch to gas burning from wood and plan to use your fireplace frequently then we recommend that you consider a heater rated gas fireplace insert. Glass gemstones that create a beautiful fire – with a variety of colors, sizes and texture to choose from, any fire you can dream of can be created. Choose your color and style, we order factory direct and pass the savings on to you. Enjoy the splendor and warmth of a cozy fire with Real-Fyre Gas Logs. Specially formulated, hand-crafted with advanced Radiant Fyre Burner System, Exclusive radiant booster grid, Custom Grate, Platinum Embers,Glowing Embers, Sand (NAT) or Vermiculite (LP), Connector Kit & Damper Clamp. Choice of optional pre-assembled electronic variable control with remote, pre-assembled manual pilot kit, or match-lit system (natural gas only). We sell clean burning Fireplaces, Freestanding stoves and inserts for gas and wood, Solar electric systems and Solar thermal systems, Title 24 Energy analysis, gas logs, hearth accessories and much, much more - Take control of your energy NOW with Pacific Energy Company! Visit with us here on the Web to check out how we can alter your energy.